All new! 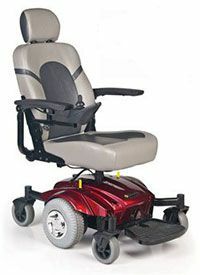 The Compass Sport GP605 is the newest addition to the growing Compass family of center-wheel drive power chairs. The Compass Sport offers many of the same features as the original Compass, including center-wheel drive, an articulating frame for outstanding obstacle climbing and maneuverability, and six wheels on the ground at all times for the most stable unit in its class! The Compass Sport includes a height-adjustable single seat post mount supporting the same two-tone Captain's seat as the Compass. Available in brilliant Red and Blue, the shrouds can be snapped off and on quickly and easily to give your Compass Sport a fresh new look.